Even when you understand reality, things can go wrong. 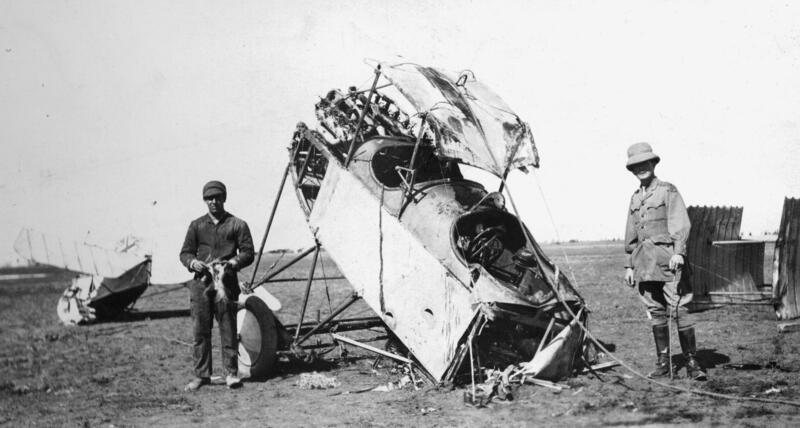 Have you ever wondered with hindsight why a project failed, despite all your effort? In “Principles”, Ray Dalio outlines how he thinks people can be more successful. The goal of his essay is to make a reader think (1) what she wants, (2) what is true and (3) what to do about this. As explained in the essay’s introduction, principles are ways of successfully dealing with the laws of nature or the laws of life. People who understand more principles well can take action more effectively. This argument – by better understanding reality we can improve our performance – compels me. We let what we wish to be true stand in the way of what is true. In the last two months, I built a team for a summer program of a new higher education institute in Amsterdam, assuming that the institute would happily work with us. If the institute turns out not to want any external help, my misunderstanding of reality led to an unsuccessful project. To improve my understanding of reality, I have used two methods. The first method aims to identify shortcomings and failures in past projects; the second aims to reduce failure in the future by writing down expected problems. Take time to reflect on your three most recent work experiences. Why did you start those projects, jobs or companies? In what sense were you successful? Where did you fail? Why did you fail? I keep a “Learning Journal” on all projects I have started or joined. 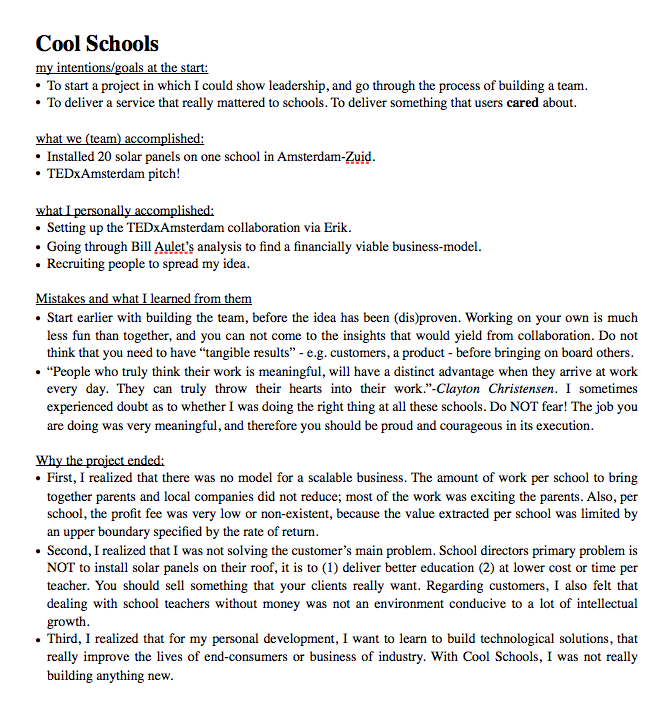 Below is one entry of my Learning Journal that reflects on Cool Schools. Read it to understand the questions I ask myself. How do you reflect on past failures or shortcomings in work? How do you keep “lessons” in sight, to avoid making a mistake multiple times? To reduce chances of future failure, anticipate your problems today. Ray Dalio suggests a 5-step process: write down your biggest goals; identify the problems that stand in the way of your goals; accurately diagnose the problem; design an action plan that gets you around the problem; execute. 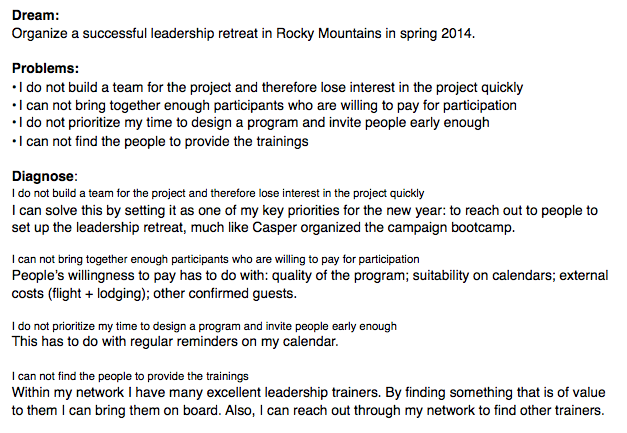 Below are the first 3 steps for one of my dreams for the next year: to organize a leadership program for my dearest friends in the Rocky Mountains. I put it here not because the content is interesting, but so you have an idea of the first steps. What are your dreams? Do you have ways to keep in sight the potential deal-breakers? What do you think of these methods? Do you consider it a waste of time to think about problems ahead of time? Do you understand “reality” through intuition? Do you have ways of better understanding reality? Like Ray Dalio’s style? Want to learn more about the economy? See this 31-minute video. This entry was posted in Life Philosophy, Opinion. Bookmark the permalink. ← Why are electric grids different than the internet?